Protesters participating in Ferguson October—a long weekend of protests against the deaths of Mike Brown and John Crawford, and police violence in minority communities—brought the struggle to an unusual place Monday night: the inside of an NFL stadium. They took over an upper section of the Edward Jones Dome for the Monday Night Football match-up between the 49ers and Rams, and protested for about a half hour. A group of cops arrived, but seemingly chose not to do anything about the chanting and unfurling of banners. And while there was some back and forth between protesters and Rams fans, there doesn't seem to have been any of the ugliness that occurred last time Ferguson protesters interacted with St. Louis sports fans. 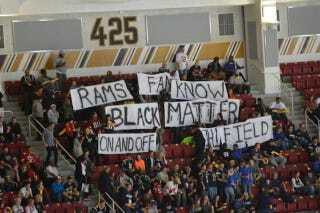 Perhaps unsurprisingly, the protest was not mentioned nor shown on ESPN.